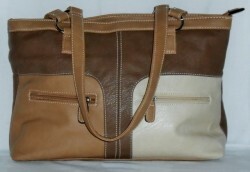 A twin handle medium size Faux Leather handbag. There is one main opening, one inner zipped pocket and two open pouch pockets. Two outside front zipped pockets. One outside back zipped pocket.